Disorders and disturbances, clashes between the “opposition” and law enforcement bodies, police officers fleeing from rally participants, freed “hostages,” loudmouthed speakers and hasty statements on the part of politicians. Does this all not sound too familiar? Yes, we did – here in Kyrgyzstan. This is how the first and the second revolutions here started. Could one say the incumbent authorities triggered the third one? 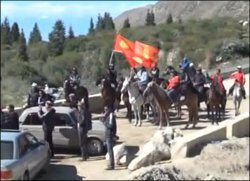 On 31 May 2013, participants of a rally against the current allocation of the income from the Kumtor goldmine launched massive disorders in three villages in Northern Kyrgyzstan. By the evening of the same day, they have depowered the electricity substation fed into the goldmine and its factories. Anarchy and chaos then leaped onto Southern Kyrgyzstan. Following several rallies (mere tens of participants’ presence was reported) in Jalalabad, a group has easily entered the building of the regional administration. They were supporters of the opposition Ata-Jurt Party who came there to install their own governor of the region. Some reports suggest Shairbek Tashiyev – the brother of MP Kamchibek Tashiyev who is convicted for an attempt of coup d’état – led the protestors. In an interview with Akipress Shairbek Tashiyev said they did not usurp power, but simply “elected a popular governor.” “We appointed Mederbek Usenov governor and he will deal with issues we are raising,” he said. Meder Usenov is also an Ata-Jurt member, who as of this writing, was summoned to Bishkek for questioning. MP Kamchibek Tashiyev’s supporters claim, “after the authorities are completely replaced” by their representatives in Jalalabad they intend to go to Bishkek and at least to release their leader from prison. But later, several sources in the country’s interior ministry stated that there was “no occupation” of the administration building, and “negotiations” are underway. In plain language, this means the power usurpers will effortlessly continue doing so as long as it takes until “negotiations” tilt for their benefit. This makes me think that their goal is not a coup or MP Tashiyev’s release. Deputy Prime Minister Shamil Atakhanov is also trying to hold “good-faith negotiations” with these hooligans, who stormed commercial and government buildings. Deputy PM Atakhanov has earlier stated that nobody among those who stormed the Kumtor would be arrested or penalized. How could an official of such caliber could say so given that emergency situation was introduced there only a day ago!.. Or did Atakhanov, whom the parliament effectively fired from post this week, accepted it and no longer wishes commanding power wielding bodies he is charge of? The sense of instability pushed other “opposition” politicians to resurface. Nurlan Motuyev, the leader of the self-proclaimed Union of Muslims of Kyrgyzstan and a odiously scandalous individual, said he would support and lead new protest rallies. That said, he was the only to circulate information in local mass media that military vehicles and thousands of soldiers were on their way to the restive region to quell the crowd. MP Felix Kulov, one of the leaders of the parliamentary majority, rushed to state that they do not support the authorities’ actions aimed at forced quelling of the “mutiny.” Thus, while it might seem like everyone has simultaneously launched their own “negotiations,” it actually is talks behind the curtain for a spot in the future configuration of power, which some one is bent to alter. It would be unwise to presume that the government and the president were caught off-guard by the situation. The central authorities knew perfectly well that the opposition was serious about its intentions to use the Kumtor goldmine for its own benefit. Apparently, the former were hoping that “controllable deterioration” of the situation would bring about grounds for pressuring the Canadian investors developing Kumtor. With that in mind, the government failed to lasso the right moment and the protests and consecutive rallies went way out of hand. Nonetheless, the official Bishkek is still firmly holding positions. As of Friday afternoon, President Almazbek Atambayev’s fellow countrymen and supporters started mobilizing. They are ready (for some payment) to support the incumbent authorities using the opposition’s methods – throwing and hurdling stones, that is. Daniil Kislov, chief editor. Fergana’s own correspondents in Bishkek contributed to this article.